Submarine Matters: Russian Submarine Industry - Lada discontinued - no AIP - LIBs? 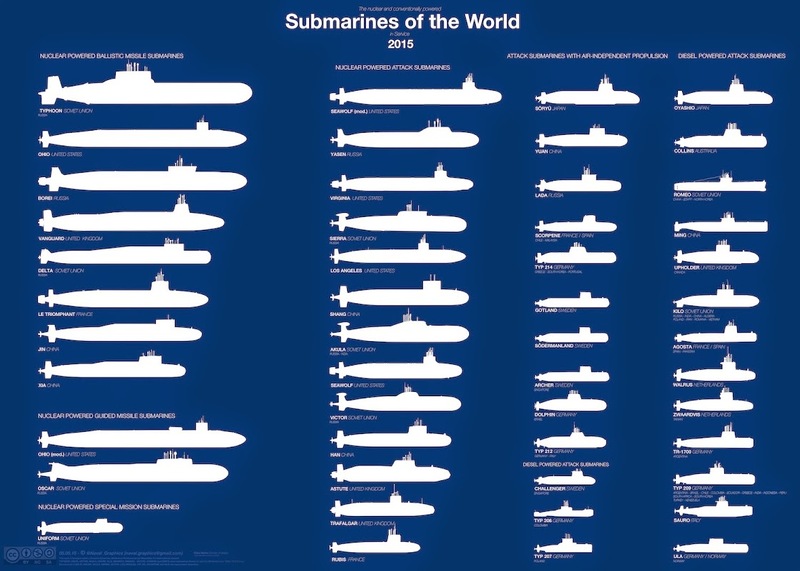 Submarine Matters provides an expanding technical and political database concerning strategic weapons (including submarines) worldwide. Russian Submarine Industry - Lada discontinued - no AIP - LIBs? Russia hopes that it could develop the 4th generation Lada class have been discontinued mainly because Russia has been unable to develop satisfactory air independent propulsion (AIP) technology for the Lada. See January 2016 reports from Russia also see this early February 2016 report. At the root of the problem is lack of Russian research-building financial and labour resources for AIP. This has made the Lada and related export Amur class, uncompetitive. 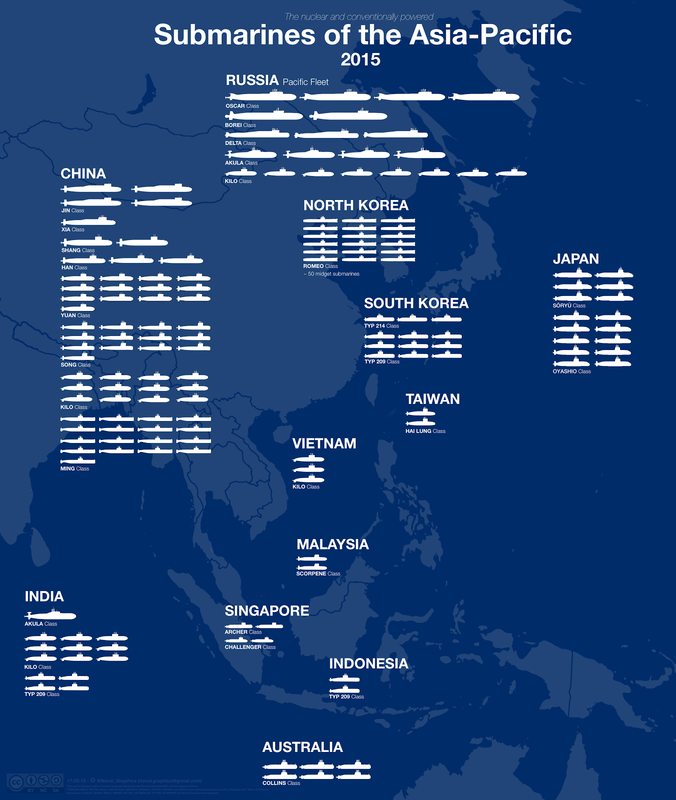 This is compared to AIP equipped submarines in Singapore, Germany, France, Italy, Sweden, South Korea, China, Pakistan, Japan and all the other countries that own TKMS 214s and Dolphins. Prospective Amur customers have probably been offered the existing Improved Kilo (636) class instead. This is assuming customers would not accept a Russian offer of a future "fifth generation" Kalina class SSK (more on the Kalina below) with the Kalinas only likely to be operational (with AIP) in the Russian Navy in the mid 2020s. - Western economic sanctions in response to Russia's ventures in Crimea and in eastern Ukraine. - Russia’s increasingly threatening posture in the Baltic. This reduces the likelihood that Baltic countries that invented the most modern AIP would supply AIP technology and designs to Russia. This includes Germany (fuel cell AIP) and Sweden (building new advanced versions of Stirling AIP). - expensive defence programs particularly include Russia interventions in eastern Ukraine and in Syria. Lack of foreign orders for Russian SSKs (other than 6 Kilos for Vietnam (almost finished) and 1 Amur for Morocco (in limbo)) has also led to a lack of money to fund Russian AIP and a new Lada/Amur class. As Russia has been unable to develop AIP for submarines, mainly Russian Navy media releases, has artificially created "progress" by naming two further generations of submarines (fourth and fifth) to replace its last actual submarine generation - the Kilo "third generation". Fourth generation Lada/Amurs are now out so a sort of Five Year Plan to build the "fifth-generation" Kalina has been declared. Customary face saving and denial has been part of the declaration process. The Kalina Future - LIBs? The Kalina Project may take until the early 2020s to launch an AIP Kalina and until the mid-2020s to fully test and commission it. It is significant that until then the Russian Navy has ordered six additional Improved Kilo class (636.3) submarines for its Pacific Fleet. It is possible the six may be retrofitted with Russian AIP once AIP is developed. Given China’s earlier interest in buying four Ladas China may be the first customer for Kalina Class submarines. Russia would realise China would reverse engineer some features of the AIP and other advanced Russian submarine features. But Russia needs the foreign exchange from the export submarine business and Russia may want to further deepen its alliance position with China. Alternatively Russia may be able to develop (through research and intelligence collection) Lithium-ion Batteries (LIBs) for Kalina submarines. This may make an AIP step unnecessary. Russia may develop LIB technology jointly with China or receive LIB technology from China. China may already have a deep enough espionage network in place in Japan and South Korea (maybe also France and Germany?) to collect substantial LIB secrets. First Generation - Whiskey Class (Project 613, 236! built), Zulu Class (Project 611, 26 built) and Foxtrot Class (Project 641, 74 built) - all heavily influenced by the most advanced World War Two German submarines. Second Generation – the ocean going Tango Class (Project 641B, 18 built). Arguably an evolution of late model Foxtrots and/or Zulus. Third Generation – Kilo Class (Project 877 and Improved 636, a total 57 built so far for both classes). 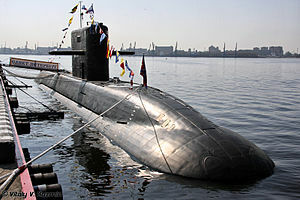 The first Kilo (of the Project 877 series) was commissioned into the Soviet Navy in 1980. Production of the early Kilo (Project 877s) began in 1980 and continued until 1999. Upgrades, particularly adding Club missile capability continue. Production of the first Improved Kilo (of the Project 636 series) began in 1996. Production of six new 636.3s (for the Russian Navy) will begin in 2016 for likely completion of the six in the early 2020s. Russia like other customers would have preferred to have AIP as an option. Fourth Generation – Lada Class discontinued (Project 677) – was to be export marketed as the Amur 1650 and smaller Amur 950. The first of the Lada Class, was the St. Petersburg (lets call it L1) entered sea trials in 2004 but was unsuccessful due to no mature AIP and broader diesel-electric propulsion problems. L1's displacement, at 1,800 tons (surfaced) is 25% smaller than submarines of the preceding Kilo Class. Significantly two other submarines in the Lada Class (lets call them L2 and L3) have not yet been completed. Fifth Generation – future Kalina Class (the future first of class can be called Kalina 1). Likely to look like the Lada. Kalina 1 may be ready for trials after 2020 fitted with Russian AIP (when developed) or Lithium-ion Batteries (LIBs). Russian shipyards, exports vessel building, naval bases and repair. It is significant that the St Petersburg shipyard cluster includes the Admiralty Shipyard where most of Russia's nuclear and conventional submarines are built. 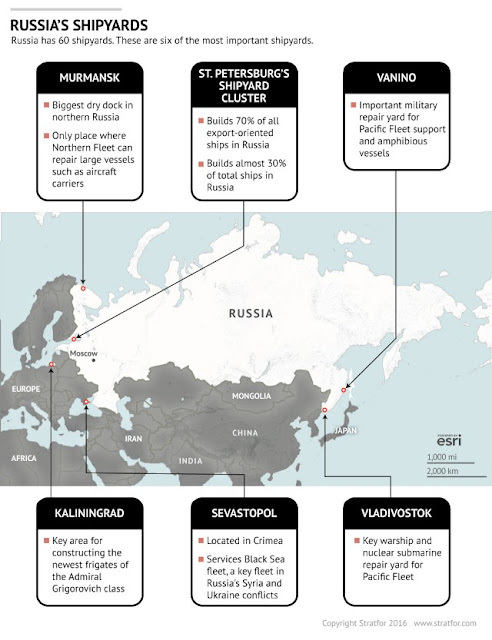 (Diagram courtesy "Russian Navy has a Funding Problem" in Stratfor 2016). 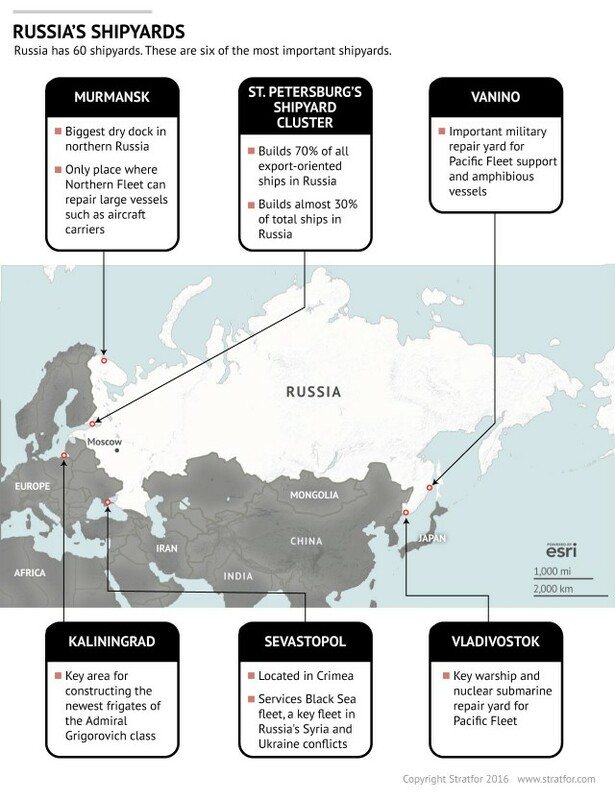 - National Interest's 5 Most Lethal Russian Submarines, July 11, 2015. What I think Russia should have done was to collaborate with China on the LIB/AIP technology for the Lada/Amur class SSK. What Russia should have done was take the same propulsion that is on the Improved Kilo 636.3 class SSK and put it on the Lada/Amur class SSK. That way the Improved Kilo 636.3 class SSK & Lada/Amur class SSK can be exported. Discontinuing Project 677 will likely lead to loss of traditional customers. Vietnam for example will receive its 6th Kilo by the end of 2016. For its next batch of submarines, unconfirmed Vietnamese sources say it is looking for AIP submarines. If I am Russia, I would look at introducing an LIB Kilo, replacing LAB to start. For state of the art LIB, Russia can go right to South Korea. Tesla LIB uses South Korean LIB cells. South Korea and Russia are having a deepening defense partnership for some years. SK's medium range SAM is basically Russia new S-350E Vityaz. SK even develops a longer range variant of the Iskander SRBM. Discontinuing the Kilo class SSK is going to be a huge mistake for Russia. The Kilo class SSK is a source of currency for them and their best Seller. If I was Russia, I would develop an LIP/AIP Kilo class SSK or even LIB Lada/Amur class SSK. Since Russia is cozying up to South Korea, they should talk to them on the LIB battery technology or AIP technology. Imagine if the Improved Kilo class SSK & Lada/Amur class SSK got LIB fuel cell battery technology. I'm unconvinced Russia is capable of introducing LIBs in any reasonable time frame, even for the Kalina class. This is a new technology they have no experience with in submarines (indeed no one does yet) and for budgetary, labor force, and infrastructure reasons I don't see Russia being able to make that leap forward anytime soon unless some other country offers a substantial amount of help - help which I don't see forthcoming for political reasons, even from China were they to have the expertise. Lada/Amur not only lacks an AIP system, it also apparently is still considered a step backwards by the Russian Navy compared to the Kilo/636 class just as a non-AIP D/E submarine - that speaks volumes of the state of affairs of Russian D/E design. Skipping the AIP stage and transitioning from LABs to LIBs makes sense for Russia. South Korean interest and joint development of Russia's new S-350E Vityaz SAM and the Iskander SRBMs looked dubious to me. Then I checked https://en.wikipedia.org/wiki/Vityaz_missile_system and https://en.wikipedia.org/wiki/9K720_Iskander#History and you're right! So the South Koreans (thought frontrunners in LIBs) supplying LIBs to Russia and even to China may well be possible! LIBs for the Improved Kilos (Project 636) may happen. The 636 production line (with existing LABs) will remain open for years supplying six for the Russian Navy. Russia already builds the full spectrum of weapons (jet engines, submarine reactors etc). So, I think, Russia has the industrial and research base to develop LIBs by the early 2020s. Russian backwardness in submarine LIBs can be redressed through espionage and also Western countries like South Korea may be willing to supply submarine LIBs to Russia. This is noting Germany has a history of supplying marine (submarine capable) engines to Russia. France and Israel have also supplied key military technology to China and Russia. I wonder what would happen if Russia decided to put LIB or PEM Fuel Cell into the Improved Kilo class (636) SSK or the Lada/Amur clas SSK. If they went that route, they could keep the Improved Kilo class (636) SSK or the Lada/Amur clas SSK lines going and instead of using AIP, they can use LIB or PEM Fuel Cell. Yes I think thats been said. PEM Fuel Cell is a type of AIP, of course. LIB basic cell happens to be a dual use technology. Today state of the art LIB cells oeing ran are supplied by Panasonic, LG Chemicals and Samsung. Tesla Motors use them in their cars and their PowerWalls. Even Audi and Mercedes will be using LG cells in their future electric cars. There is nothing that prevents Russia from buying those LIB cells in the open market. They then benefit from the lowest cost possible. There is no need to develop your own LIB cell. The main challenge comes in physical packaging when you series-parallel them into a higher KWH battery. Russia can reverse engineer solutions provided in commercial applications to overcome the packaging issues and shorten the development cycle. I believe going to LIB will be easier than developing an efficient fuel cell. Yes, they have to redo their controller but that is relatively straightforward. Given 2 out of 3 suppliers are Korean, I will be surprised if the Koreans are not already looking at this packaging for their type 214. If true, then it is possible for Russia to negotiate for a transfer of technology since the South Koreans are partnering with Russia for their ABM upper tier interceptor. It appears that interceptor is based on the S-400. Clearly South Korea is gradually spinning out of the US sphere. That will have long term ramifications in the region. I suspect buying LIBs in quantity is somewhat different from engineering them to operate reliably tightly packed in the spaces of a submerged vessel. I don't think just obtaining or producing LIBs will be the stumbling block but rather the actual operational, *safe* usage in a boat - I'm not completely convinced the Japanese will go through this process without stumbling; I've no faith in the Russians in this regard given their safety and quality control record. But perhaps they will surprise me. Besides the lack of AIP, Project 677 likely presents numerous technical deficiencies leading to its demises. From Bruce Rule's articles at the IUSS alumni web site, I do not know there are actually 2 variants of Project 677. The 1st boat, St Petersburg's diesel electric propulsion uses the 40% smaller (relative to the 1DL42 in Kilo) D49 ED2 V8 generators which proved to be under performing, producing less than half the rated power. That boat also uses an older 2700hp electric motor dating back to late 1940s. The 2nd Lada B-586 then becomes the lead of a new class Project 677M since the propulsion plant was apparently changed out, besides a new bow (to address sonar issues)! The D49 was replaced by the long stroke six cylinder engines 1DL42 used in the Kilo. The 2700hp motor is also replaced by the same 5500hp electric PG-141 motor first used in the Juliett class and now found in the Kilo and Yasen classes. These changes result in new 4th and 5th compartments and possibly a longer hull. I am surprised that Russia used originally the D49 with square bore to stroke ratio since operating the D49 at 1000rpm will likely generate more noise than the slower turning 750rpm 1DL42. Given the Lada is a single hull design, any additional noise generated may be detrimental to its acoustic signature. Going back to the Kilo propulsion means there is one less compelling reason to switch from 636.3 to 677. The Kilo's double hull can be potentially quieter than Lada. Some of the new features developed for Lada could be transferred to a later Kilo design. From the site http://daypic.ru/technique/157982, we can see instead of just a propeller hub cap, Lada has a vortex cancelling generator which can reduce noises generated by vortex cavitation. The design is suficiently secret to be shrouded. You can also see the 2 auxiliary thrusters used on the Lada. Mr. Rule also points out that Project 636 implements a planetary gear reducer to slow down the propeller from 500rpm to 250 at top speed relative to project 877. And that project 636.3 implements even greater reduction ratio so the propeller is slowed further to 170-200rpm. Still at 3-4kts, the propeller is only at 45rpm. I wonder if Kalina (likely vaporware today) will just be a further improved 636.3 with LIB and with a smoother rear end and sail, similar to the Beluga diesel research submarine. With a limited budget, that would be a more pragmatic and better evolution. Yes buying LIBs in quantity is different from engineering them to operate reliably tightly packed in the spaces of a submarine. LIBs have to be grouped in a submarine so as to be stealthy. This is in terms of not putting an electromagnetic signature through the hull that could be detected by ASW sensors. Safe use is definitely a major requirement. Adopting LIBs (from Germany, France or Japan) for the Australian future submarine does involve risk and uncertainty, eg. how LIBs operationally used in subs for 8 years has not been tested (to my knowledge). Yes (I suspect) the Russians (devoting most to nuclear) have comparitively meagre resources to earmark to SSK development so "safety and quality control" may be below Western standards. 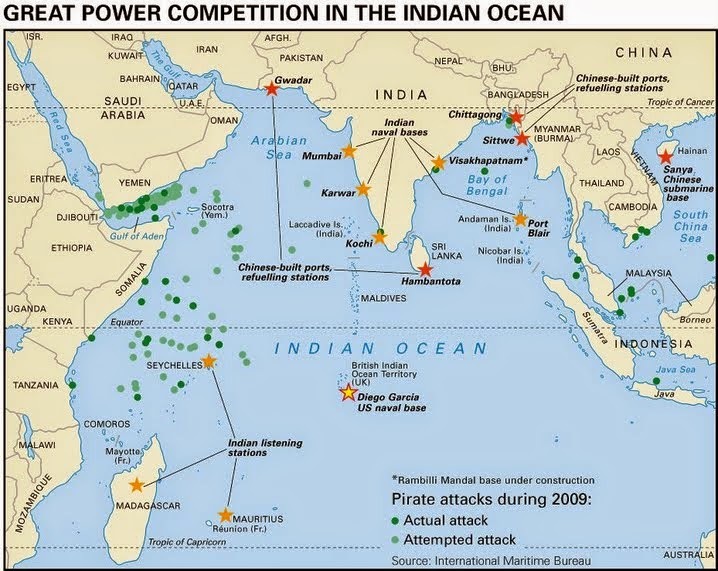 This is particularly compared to Germany and Japan who have no nuclear submarine distractions. In your 29/1/16 10:21PM and 30/1/16 5:17AM comments you have provided a wealth of detail that I'll turn into an article next week. I was also curious about the Kilo and Lada (Project 677) propulsion comparisons but couldn't find much detail. You've found the detail and analysed many of the issues. Russia may indeed be better placed to keep its existing Kilo customers if a Kalina is shaped like an improved 636.3 (but with LIBs etc). Spares, knowledge and training customers have are centred on the Kilo. The costs to Russia (with much passed on to customers) of developing a whole new hull could be avoided. Set against that is the high weight (2,350 tons) surfaced of the Kilo design and large size (having double hulls). This is likely to have downsides in terms of running costs and detectability of larger objects. Compare that with the (competing in the world market) 1,700 ton (surfaced) single hulled Type 214 which could be even smaller if it was LIB only, without the weight/space of the 214's AIP. The whole Russian submarine program is on life support since the collapse of the Berlin wall and that applies to even their latest SSBN and SSN. The Borei class SSBN is a stretched Akula with the same bow and stern sections (the US also did this years ago for its earlier SSBN) using propulsion plants recovered from decommissioned Oscar II SSGN! Yasen SSN is also based on Akula. The main improvement comes from the use of turbo electric propulsion at slow speeds to reduce the sub's acoustic signature. Steam turbine driving planetary gears at slow speeds produce gear noises unless those gear teeths are machined with extremely tight tolerances. Planetary gear noises at slow speed constitute an Achille's heel for Kilo and Lada as well. The German U212 and 214 also use them but I am sure one can count on German manufacturing prowess with multi-axis CNC machines to minimize noise. U212 and U214 use diesel generators driving an AC motor before converting it back to DC. That is more efficient than diesel generators driving a DC motor as used in the Kilo. The Lada has the same approach as the U212/214 but the physical implementation was deficient. The other advantage of U212/214 is the blended small sail that minimizes snap roll during high speed directional changes. The Kilo with its ugly square box like sail (same for Lada) is just plain bad with snap roll. I am surprised the Russians did not design a sail like the one on their Alfa for their diesel submarines. batteries of any kind will never have the energy density of a fuel like Methanol or diesel. The Tesla battery car is an in between technology until fuel cell cars with liquid fuels are available. There will always be the need to store energy for a certain time. Porsche racing cars uses a different technology to store energy: a flywheel. LIBs are nice for mobile phones. P.S. : Russia showed that fuel cells are not so easy to mature. There might be a reason why not even Japan can offer high power fuel cells. Russia under Putin is no doubt the most ambitiously capable (which Iran and North Korea would certainly wish to be) military now on the globe. Russia's engineerrs and scientists, like the U.S.'s are also highly capable. I would not put much trust in such announcements by either. Spheres at the root of the propeller blades, on both leading edges and trailing edges, change local pressure and delay onset of cavitation. The propeller hub as a cap with 4 vanes to minimize hub cavitation. This is a far cry from the simple 6-blade propeller on initial project 877. Even then, Indian open sources claim the 877 is quieter than the type 209. With both 636 and 877, the 7 blade propeller blade presents high aspect ratio. They are highly skewed to minimize low frequency blade rate noises. Propeller design is both a science and an art so it is no surprise Russia has standardized on 7 blade skew propeller for many SSN including the Yasen. Kilo hull formn is envisioned nearly as body of revolution with no straight sides as seen on the Lada and nearly all other submarines like Soryu, type 212/214, Scorpene, Virginia, etc. Straight sides are design compromises to lower manufacturing costs and optimize internal volume and layout with minimum trade off on hydrodynamic noises. Like the type 212, Kilo hull length to beam ratio is nearly optimum (from the stand point of hull drag) in the range of ~7-8 while Scorpene, Soryu, Lada all present higher ratio. Australia should indeed be cautious with the CEP requiring Lithium-ion Batteries (LIBs). After more than a century of use lead-acid batteries (LABs) are highly developed and well suited to submarines. Much of LIBs attraction and Australia's LIBs requirement rests on Japan's claims and optimism about LIBs. If all of Australia's new subs use LIBs Australia will be the first test bunny in the world totally reliant on LIBs. LIBs have not been tested operationally by any navy. I hope Australian politicians and admirals are aware they are staking all on LIBs. True. With Russia's oil-price civilian economy going downhill but with Putin pushing Russia into ever more military ventures (to boost his strongman image) - Russia may well be following North Korea's wartime style. "As was earlier reported, an anaerobic powerplant for the Russian Navy is being developed by the Rubin Central Design Bureau for Marine Engineering." Peter Coates analyses political and technical aspects of submarines and other weapons. In 2014 gained a Master of Arts (International Relations) High Distinction average. 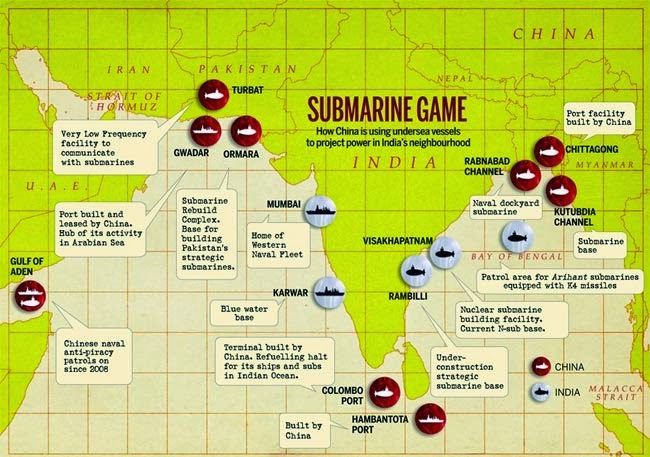 If you're looking at an old article, for the latest article, click on Submarine Matters, largest letters, right up top. The best way to navigate this site is to put a keyword in the search box, top left corner. Agni 6 (Agni VI) Why would India want to develop a 10,000 km Range ICBM? Indonesia revisits buying Kilo submarines.